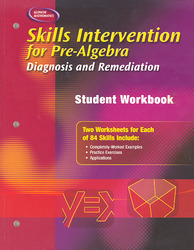 Skills Intervention for Pre-Algebra is a convenient educational tool that increases and maintains mathematical competency. The Skills Intervention programs are easy-to-use, manageable programs for summer school, after school, and intervention programs. Diagnose students’ algebra content and strand needs with Diagnostic Pretests. Use Student Workbooks to cover needed algebra content or strand. Administer Posttests for each strand to confirm student understanding. Provide students with online learning with Tutorial Intervention CD-ROM. Use Teacher Guide and Teaching Transparencies to customize your algebra intervention program.